Inventors Lee deForest and Frank Buttler First established the first radio broadcasting station in Toledo in 1907. The station was housed in the National Bank Building. Lee deForest, had over 180 patents - among them the audion, a vacuum tube that amplified electrical signals. 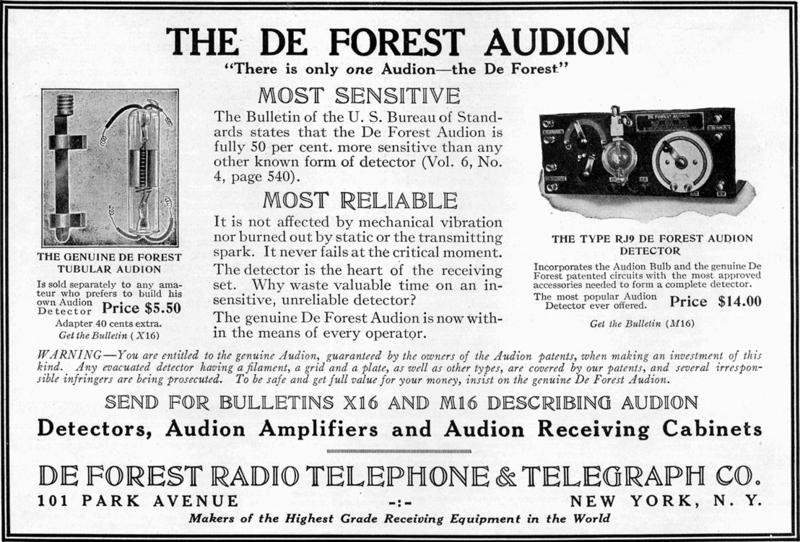 Later, deForest sold the audion patent to AT&T. As a child deForest loved anything mechanical. He tinkered with machines, and as a teen was building miniaturized blast furnaces and locomotives, and also devised a silverplating mechanism. deForest studied at Yale University, and did his dissertation on high-frequency oscillation effects in parallel wires. It was one of the first treatises on radio waves and explored the possibilities of wireless communication. His first job was with Western Electric Company in Chicago, where he started in the telephone department and then moved on to work in the experimental laboratory. In 1907 saw the launch of the DeForest Radio Company. An early company advertisement stated: "It will soon be possible to distribute grand opera music from transmitters placed on the stage of the Metropolitan Opera House by a Radio Telephone station on the roof to almost any dwelling in Greater New York and vicinity... The same applies to large cities. Church music, lectures, etc., can be spread abroad by the Radio Telephone." For the next ten+ years deForest broadcasted from points all over the world, popularizing radio to the point that by the 1920's many U.S. homes had their own "radio sets." Lee deForest also was a strong writer, frequently contributing to scientific journals or electronics publications. In 1950, he wrote an autobiography called "Father of Radio." He also wrote several film scripts, hundreds of poems, and kept a daily journal. deForest died in 1961 and was inducted into the Radio Hall of Fame in 1989.